COLUMBIA - A recent report shows Columbia hasn't made much improvement when it comes to creating a safe and friendly environment for cyclists. “The further you get away from the center of town, the worse it is,” Heather Marriott said. She's been using a bike as transportation for eight years. The League of American Bicyclists renewed Columbia's designation as a Bicycle-Friendly Community. However, while the city received the designation, it only earned a silver ranking. The rankings are are listed as follows from first to last: Diamond, platinum, gold, silver and bronze. Columbia also received a silver mark in 2014, suggesting there hasn't been enough progress toward earning a gold rating. “I think that it makes complete sense that [the ranking] hasn’t changed," Lawrence Simonson, Assistant Director of nonprofit organization PedNet Coalition, said. 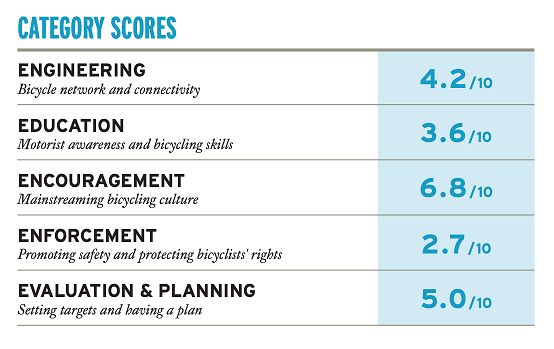 Bicycle-friendly communities are ranked in five categories. This graphic is from the League of American Bicyclists website. “As you start to look around the country, other communities whether larger than ours, our size, or smaller than ours, we’re really starting to not be ahead of the curve anymore." Simonson said. Simonson attributes this decline to other communities building - then surpassing - Columbia's initial progress. Community improvements can include building bike lanes and bike paths quickly, and passing policies that promote a bicycle-friendly community. The bike-friendly designation will last until 2022 when another application will be required.